Kirschner wire (K-wire) migration into thoracic cavity and organs are uncommon but can have fatal complications. A 60-year-old gentleman had repair of dislocated left acromioclavicular joint with K-wire, which migrated, from the joint into left lung and mediastinum. He was successfully treated by thoracoscopic retrieval of migrated K-wire. Kirschner wires (K-wire) introduced in 1909 by Martin Kirschner are widely used in orthopedics for the fixations of fractures and dislocations of the shoulder girdle including the proximal humerus, clavicle, acromioclavicular (AC) joint, and sternoclavicular joint. Although uncommon, migration of K-wires to thoracic cavity is known and can have fatal cardiovascular complications. Immediate retrieval of the K-wire or pin is paramount to avert these complications. We report a case of 60-year-old patent with the migration of K-wire through left lung into mediastinum without major vascular injury that presented after a period of 9 months following repair of the dislocated left AC joint. A 60-year-old gentleman was referred to our thoracic surgery clinic from a peripheral hospital with the diagnosis of a metallic foreign body in the left lung. He had a dislocated left AC joint, which was fixed with K-wire by an orthopedic surgeon. He was later lost to follow-up and attended the clinic of orthopedics with complaints of a cough and pain in the left chest after a period of 9 months. A chest X-ray done showed migrated K-wire from the AC joint into left lung [Figure 1]a. Contrast-enhanced computed tomography of the chest showed a metallic foreign body in the left lung entering the mediastinum [Figure 1]b. He was planned for immediate thoracoscopic foreign body removal following necessary preoperative investigations for anesthesia fitness. The operation was performed with elective single lung ventilation using the left side double-lumen endotracheal tube and CO2 insufflation for optimal visualization of structures in the operative field. The patient was placed in supine position with head end raised to 30° (low Fowler's position) on the operating table. Standard laparoscopic instruments and ports were used for the surgical procedure. First, 10-mm port was created at 6th intercostal space along the anterior axillary line, which was used for the introduction of 30° down viewing endoscope. Two additional 5 mm ports were created at 5th intercostal space along midclavicular line and 3rd intercostal space along the anterior axillary line [Figure 2]c. The left upper lobe lung was adherent to parietal pleura. K-wire is seen traversing the left upper lobe lung and entering the mediastinum in subaortic space [Figure 2]a. The metallic pin was gently pulled out of mediastinum by holding the pin with laparoscopic Allis grasping forceps. The lung parenchyma was manipulated with a atraumatic bowel grasping forceps, and the pin was gently pulled out of the track in the lung. The 7 cm long metallic pin was retrieved through 5 mm port site [Figure 2]b and [Figure 2]d. There was no bleeding or air leak from the lung during the operative procedure and the total operating time was 30 min. A 24-Fr chest tube was placed in the pleural cavity, which was removed in the morning next day. A check chest X-ray done confirmed bilateral expanded lung, and he was discharged from the hospital on the day 1 after surgery. K-wire is used for fixing the fractures and dislocations in the shoulder girdle area. There were case reports published in the journal mentioning the migration of pins and resulting in complications. Lyons et al. published a review of 37 case reports of K-wire or pin migrations. There were 49 instances of migration of orthopedic pins in 47 patients to a variety of locations including lung, mediastinum, major airways, and major cardiovascular structures. Migrations of a metallic pin can result in fatal complication due to injury to major cardiovascular structures. They reported a sudden death in six of nine patients who were not operated even after the diagnosis of pin migrations were made. Therefore, it is necessary to remove all metallic pins immediately on recognition of its migration into intrathoracic structures to avoid mortality and morbidity. Several precautions should be taken if K-wires are to be used for internal fixation of shoulder girdle fractures and dislocation. To prevent potential migration, it is highly recommended to bend the subcutaneous end of each pin into the shape of a walking stick, use restraining devices, carry out close clinical and radiographic follow-up, and withdraw the wires at the end of treatment. Failure to adhere to these recommended precautions could be responsible for the migrated K-wire in our patient. Majority of the reported cases of migrated K-wires are removed through a thoracotomy approach as it provides an excellent opportunity to retrieve the migrated metallic pins from the thoracic cavity with ease.,, Video-assisted thoracoscopic approach is an ideal alternative technique to retrieve the migrated metallic pins from the thoracic cavity. We believe, video-assisted thoracoscopic surgery (VATS) approach allows for safe retrieval of the pins due to excellent visualization of all structures in the thoracic cavity. Moreover, VATS can be converted to thoracotomy in the event of any intraoperative difficulty while manipulating the pin. Lyons FA, Rockwood CA Jr. Migration of pins used in operations on the shoulder. J Bone Joint Surg Am 1990;72:1262-7. Regel JP, Pospiech J, Aalders TA, Ruchholtz S. Intraspinal migration of a Kirschner wire 3 months after clavicular fracture fixation. Neurosurg Rev 2002;25:110-2. Batın S, Ozan F, Gürbüz K, Uzun E, Kayalı C, Altay T, et al. Migration of a broken Kirschner wire after surgical treatment of acromioclavicular joint dislocation. Case Rep Surg 2016;2016:6804670. Venissac N, Alifano M, Dahan M, Mouroux J. Intrathoracic migration of Kirschner pins. Ann Thorac Surg 2000;69:1953-5. Sarper A, Urgüden M, Dertsiz L, Demircan A. Intrathoracic migration of Steinman wire. Interact Cardiovasc Thorac Surg 2003;2:210-1. Sergides NN, Nikolopoulos DD, Yfadopoulos DK, Novi EA, Kanata MP. 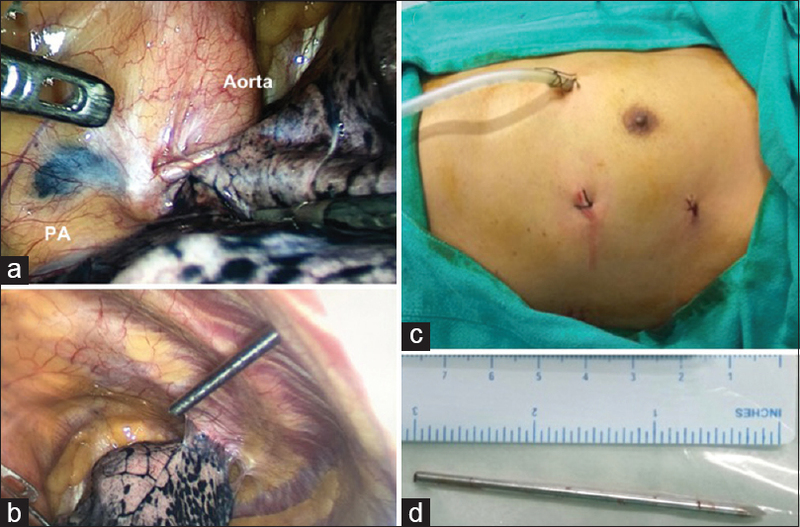 Intrathoracic migration of a Steinman wire: A case report and review of the literature. Cases J 2009;2:8321. Nakayama M, Gika M, Fukuda H, Yamahata T, Aoki K, Shiba S, et al. Migration of a Kirschner wire from the clavicle into the intrathoracic trachea. Ann Thorac Surg 2009;88:653-4.